The traffic on Hrushevskoho Street in Kyiv is blocked by protesters' tents, while the rally on the Constitution Square has not yet begun, according to an UNIAN correspondent. Some 200 protesters remained outside the Verkhovna Rada on Wednesday as of 09:30 Kyiv time. Metal fences have been installed on Hrushevskoho Street, down from the parliament building and almost reaching the intersection with Lypska Street. The police are checking bags and other belongings of those trying to get to the site where the protesters are located. There are about 20 military-type tents installed on Hrushevskoho Street. 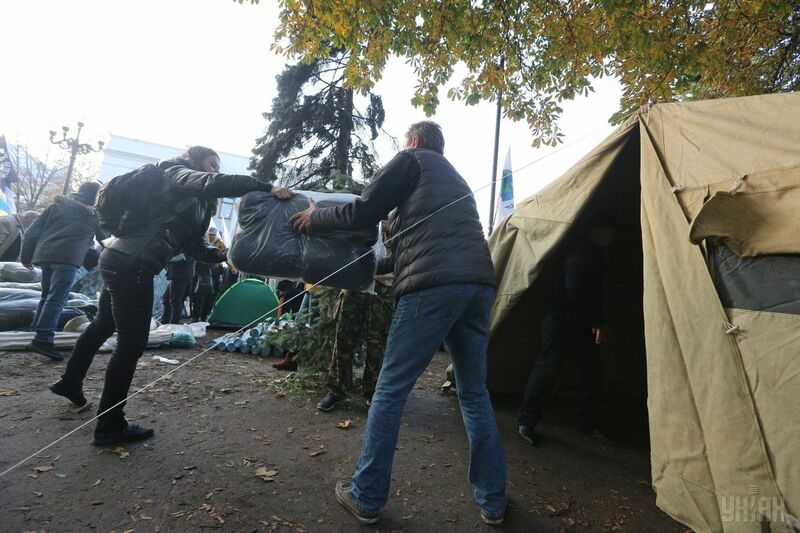 Read alsoProtesters clash with police outside Rada (Video, photo)Smaller tourist tents have been erected in front of the central entrance to the Verkhovna Rada building, at the Constitution Square. In addition, there are at least eight large tents in the park in front of the parliament. The building of parliament is cordoned off by police and the National Guard. The situation remains calm. The police are calling on rally participants via loudspeakers to observe the rule of law and not to succumb to provocations, warning protesters of liability for illegal actions.